There are a lot of decks scattered around this blog. This page aim to gather a solid chunk of the posts focused on deck ideas, including the more fringe techs that may not grace the Decks to Beat page. Suicide Blue is a very aggressive blue deck that focus on mana curve and quick hits. RUG Zoo with burn, Power and Efreets. 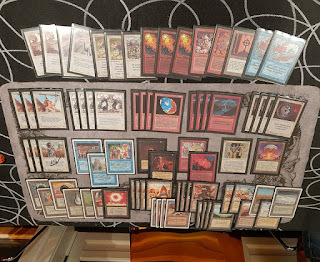 This post shows Mark Rosewater's UG Stompy, which he played at Worlds 1994. A deep dive dissecting monred Sligh. White Weenie combines quick and effective threats with strong removal spells and Armageddon. A look at monored Atog with heavy Artifact hitters. Yeah, it is a bunch of Kobolds. 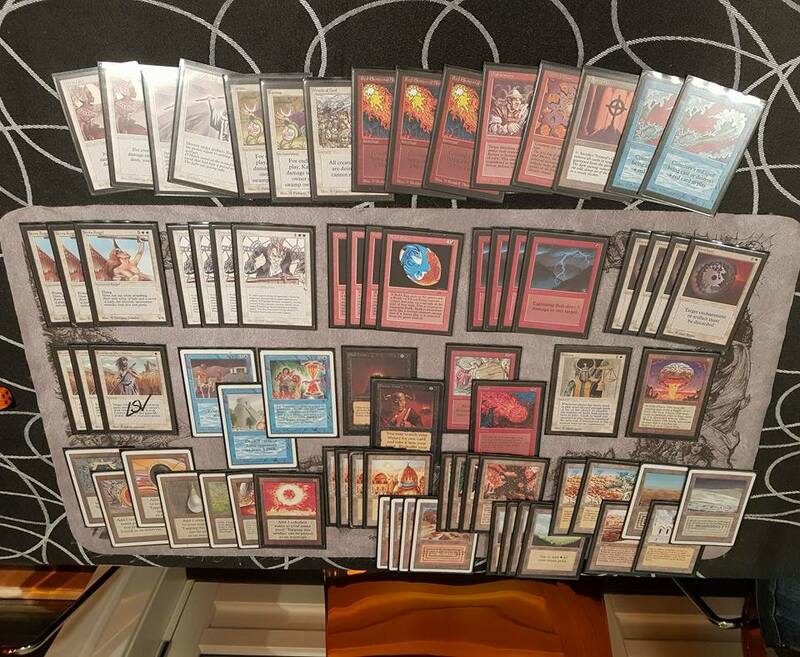 Classic RG archetype with Erhnam Djinn, Berserks, Giant Growths and burn spells. Monored Burn with Howling Mine / Relic Barrier for card advantage. Monored Nevinyrral's Disk synergies, backed up by burn and mana denial. Two takes on MonoBlack Tempo, one more aggressive than the other. One of my earlier attempts on MonoGreen midrange. An early version of W/B AggroControl with quick threats backed by Sinkhole, Disenchants, Plows and hand disruption. A powerless WG version of a deck that wants to drop a fattie followed by Armageddon. UR Electric Eel on a slightly lower budget. Monoblack Meekstone control with Guardian Beasts. Juzam, Birds and land destruction in a glorious pile. 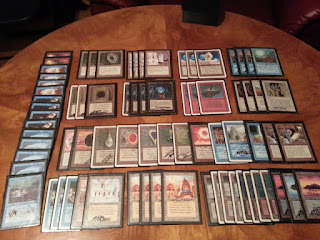 WB Armageddon/Moat deck with Underworld Dreams and Hypnotic Specters. BG Mycosis, aka Fungusaur Aggro, combines Fungusar with Pestilence to grow a huge dinosaur while sweeping the rest of the board. AtogFlare combines the ramp of Candelabra and Mana Flare with huge Atog strikes. A strange black combo deck that use Priest of Yawgmoth, Colossus of Sardia, Animate Dead and Skull of Orm to generate a massive recurring army. A GB version of the Skull of Orm reanimate deck, here with Berserks and All Hallow's Eve. Deathlace Combo with Northern Paladin and Exorcist to blow up permanents. The original Moss Monster deck with Aisling Leprechaun and CoP: Green. Not that much info here, but a new take on the Leprechaun deck, as well as a deck that plays Inquisition. Land Tax / Land's Edge combo with Thunder Spirits and a full grip of Lightning. An early variant of the "CandleFlare" strategy; The Dragon use Mana Flare and Candelabra of Tawnos to create huge fireballs and one-shot attacks with Shivan Dragon. A quick look a two different Power Monolith builds; strategies that use Power Artifact and Basalt Monolith to generate an arbitrarily large amount of mana. TwiddleVault combo to gain all the turns, as designed by Felipe Garcia. Theory crafting around Fork Recursion combo. Let's play all our cards! Go nuts with Lich and Dark Heart of the Woods. 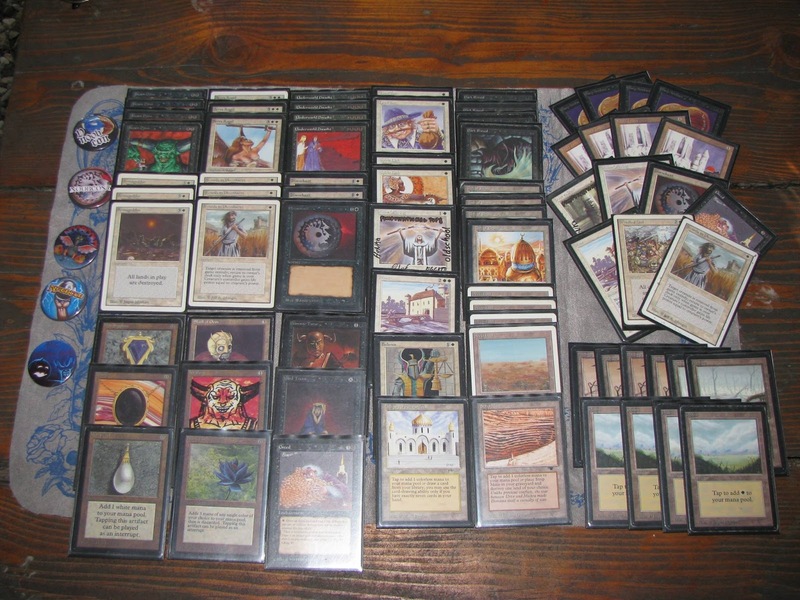 A high octane version of the "Trick Deck", this full-power (and five-color) Draw7-deck use Underworld Dreams and cards like Winds of Change to deliver the killing blow. Resolve Verduran Enchantress, play a bunch of Enchantments, profit. UW Archaeologist tries to maximize value by recurring artifacts with Argivian Archaeologist. 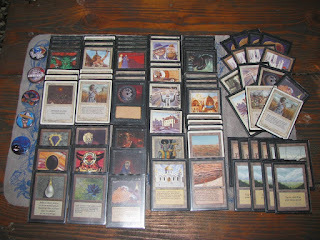 Glasses of Urza / Word of Command deck, with The Abyss and Triskelion/Coffin for value. UG Sindbad deck with Power Monolith finisher. While not a deck tech post per say, this shows some evolution of the Project M deck (along with an evolving Trick Deck and some other lists). Field of Dreams millstone control. Living Plane / Drop of Honey lock down combo. WR Land Tax / Land's Edge combo. We find an old (and not that optimal) Ali from Cairo combo list. 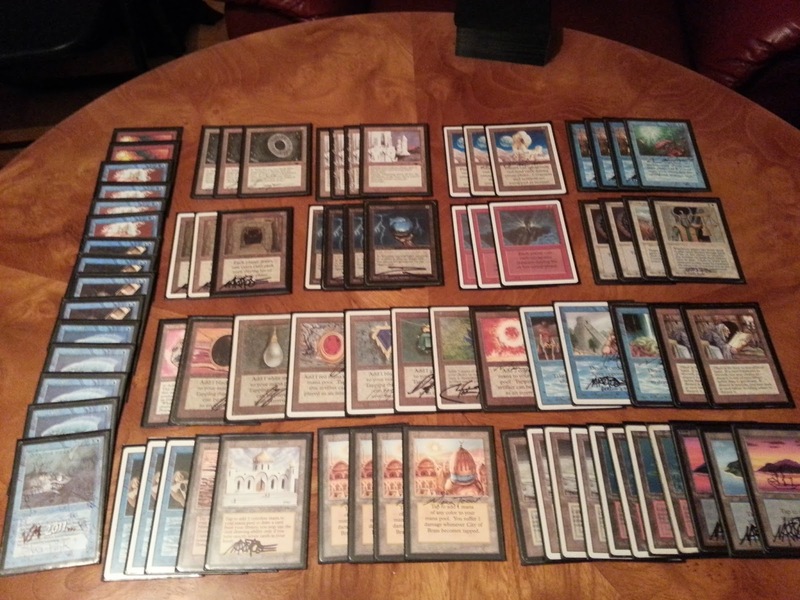 Monoblue control deck using Transmute Artifacts, Mana Vault, bounce, and a handful of Amnesia. A monoblack control deck that locks out the opponent and kills with a thousand pings. We take a look at Heiner's Mana Vortex prison in a meta with unrestricted Black Vise. Tapout Control with Smoke, Icy Manipulator, Winter Orb, and Millstones. BRu Nether Void Ponza deck, with Greed/Ivory Tower for maindeck card advantage. Tournament report with Monoblue Transmute. Also shows Rasputin Control and Monogreen 1/1s lists. Introduction to one of the most infamous decks in the history of Magic, simply knows as The Deck. Tournament report with a highly tuned 2018 version of The Deck. Some history and deck tech on Stasis (note that the post is from before the unrestriction of Black Vise). Hans Henrik takes us on a deep dive into UR Ali from Cairo, Power Colossus, and MonoGreen Mirror Universe. 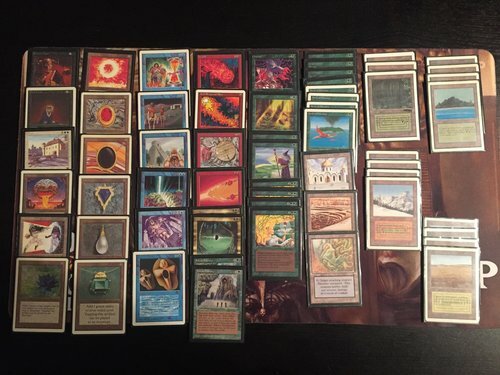 Hans Henrik is back with Old School Lands, Tribal Goblins, and MonoWhite Suleiman.